NEW LED SHOES ARE THE BEST IN FOOTWEAR WORLD AT THE MOMENT. 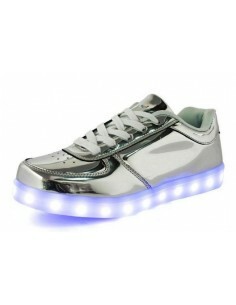 THESE SNEAKERS HAVE GOT MORE THAN 7 PERMANENT COLOURS AND ONE COLOUR THAT CHANGES AUTOMATICALLY THE LIGHTS OF THE SHOE. BATTERY IS CHARGED BY USB AND LASTS MORE THAN 6H. NEW LED SHOES ARE TREADING REALLY STRONG. IF YOU ARE LOOKING FOR LED SHOES, MGSHOPS IS THE PERFECT SITE TO FIND THEM.